The death of a child is a tragic event, especially if that death could have been prevented. 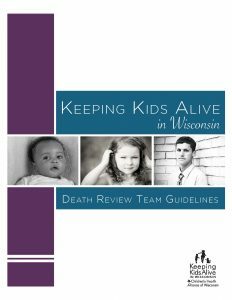 Keeping Kids Alive (KKA) in Wisconsin is a system of multidisciplinary county and regional-based review teams. The purpose of these teams is to better understand the risk factors and circumstances surrounding a child’s death and to develop policy and program recommendations to prevent future deaths. Learn best practices for setting up a death review team, conducting effective reviews, as well as entering and analyzing data. Infant mortality is a national and local public health concern. View the most recent SUID data. 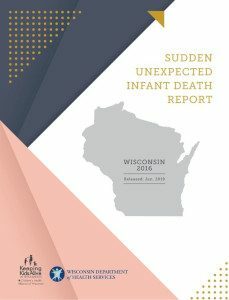 View and compare the 2015 data on SUIDs in Wisconsin. FIMR teams review stillbirths and infant deaths (up to age 365 days) to improve birth outcomes and reduce disparities. Mothers who have experienced losses are offered maternal interviews to share their lived experiences. 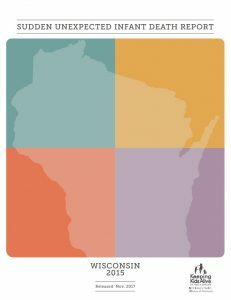 The Alliance provides technical assistance, training and support for the six FIMR teams in Wisconsin. CDR teams primarily review deaths of infants and children, ages 0 to 18, which are reportable to the medical examiner or coroner. Interagency collaboration allows CDR teams to make data-driven prevention recommendations. The Alliance provides technical assistance, training and support for more than 50 CDR teams in Wisconsin. The Alliance hosts an annual conference for Wisconsin CDR and FIMR team members and child health advocates. This event explores trends in child death at the local, state and national level, providing best practice prevention strategies and fostering partnerships and collaboration. The Council is composed of experts from across the state, including representatives from state departments, health systems, advocacy groups, and coroners and medical examiners. The Council monitors statewide CDR and FIMR data, provides policy guidance and supports local death review teams. Additionally, the Council reviews cases when there is no CDR team where the death occurred, or when a local team requests a review. The Alliance helps to facilitate Council meetings and membership. – William H. Perloff, M.D. Quarterly local, state and national news on childhood injury and prevention. Keeping Kids Alive in Wisconsin is funded in part by the Wisconsin Department of Health Services, Division of Public, MCH Title V Services Block grant through the Health Resources and Services Administration, Department of Health and Human Services.